§ The 1951 Retro Hugo Awards, voted by members of the 2001 World Science Fiction Convention for works published in 1950, were announced Friday evening, August 31, 2001, at the Millennium Philcon in Philadelphia, Pennsylvania. § The 2000 Sidewise Awards, given to works of alternate history, were announced Thursday August 30, 2001, at the Millennium Philcon in Philadelphia, Pennsylvania. Two original pieces of art by Michael Kaluta disappeared from his Artist's Alley table at the San Diego Comic Con, Saturday, the 21st of July, 2001. One work was the cover to Books of Magic: The Girl in the Box #5 while the other was the cover to Witchcraft; both were published by DC Comics' Vertigo imprint. They were in a protective plastic sleeve, one facing each side, measuring approx 15" x 20". Any information concerning the possible whereabouts of one or both of these originals would be appreciated by the artist. In accordance with the rules of the San Diego Comic Con and their Security Provider, Elite Show Services, an incident report has been filed with the San Diego Police Department and, unless it turns out otherwise, the disappearance of the art will be treated as a theft. Of the incident Kaluta says, "I, personally, still think there was an inadvertent removal of the art and that it will be returned when discovered among someone's convention purchases. However, should anyone reading this message be approached with either of these pieces for sale, you now know that whoever is offering them does not have my permission to do so." If anyone has any information he can be contacted via email at mwkaluta@kaluta.com. § "We Who Have Read The Girl Detective", a play based on a short story by Kelly Link, will make its debut on August 30 in Philadelphia. Inspired by Link's story "The Girl Detective", the play runs from August 30 to September 9 at Olde St. Augustine Church, N. 4th New Street (one block north of the Benjamin Franklin Bridge). § The Odyssey writing workshop, held in Manchester, New Hampshire, ran for 6 weeks from June 11 to July 20. Jeanne Cavelos served as director, and Terry Brooks was the writer-in-residence. The photo above, taken by Judine Brooks, shows left to right, front row: Rebecca Shelley, Jennifer Weideman, Terry Brooks, Laurie Lemieux, Sarah Kelderman; middle row, starting with individual in hat: Jason Allard, Jo Weddell, Susan Sielinski, Rob Bland, Darren Moore, Jeanne Cavelos; back row: Jim Hall, Danny Llinas, Pam Metcalf Harrington, Chris Dobe, David Corwell, Julia Hart, Dave Kirtley. § Astronomer and writer Sir Fred Hoyle died Monday, August 20, in Bournemouth, England, according to the New York Times and other reports. He was 86. He was a well-known but controversial astrophysicist who advocated numerous unorthodox theories, most famously the "steady state" explanation for the origin of the universe, first propounded in 1948. Hoyle coined the term "big bang" to mock the rival theory, then saw the term pass into common usage as evidence mounted against him and the Big Bang theory became scientific orthodoxy. He wrote popular astronomy books before publishing his first SF novel, The Black Cloud (1957), a minor classic focusing on scientists' reactions to the discovery of a sentient cloud of gas from space. Later novels included Ossian's Ride (1958), TV novelization A for Andromeda (1962, with John Elliott), and October the First Is Too Late (1966), in which sections of a time-slipped Earth exist simultaneously in different eras. A number of later novels were cowritten with his son Geoffrey Hoyle. Hoyle continued to write popular science books, many with Chandra Wickramasinghe and exploring further maverick hypotheses, such as Lifecloud: The Origin of Life in the Universe (1979) and Cosmic Life-Force (1988), which argue that organic molecules from comets formed the basis for evolution on Earth. § Nominations for the 2001 British Fantasy Awards have been released. Winners will be announced during the British Fantasy Society's 30th Birthday Bash in London on Sept. 23, 2001. A special award, the Karl Edward Wagner Award, will be decided by committee and also announced at the Awards Ceremony. § Tolkien News: Police in Kazakhstan are cracking down on Hobbit fans. J R R Tolkien's Lord of the Rings is very popular in the countries of the former Soviet Union, where thousands of fans dress up and re-enact scenes from the book. But this innocent if dotty pursuit is seen as subversive by the notoriously brutal police in Almaty, the former capital of Kazakhstan. It is part of a wider drive against those whom the police suspect of enjoying "bohemian" lifestyles. § The editorial in Dr. Dobb's Journal for September reports on last month's Campbell Conference, held in Kansas City in conjunction with the Campbell and Sturgeon Award ceremonies, which had as its theme "Science Fiction in the Electronic Era". The consensus around the table at the Campbell Conference seemed to be that the current crop of e-books have a ways to go. They're too expensive, too fragile, too buggy, and the content too limited. Not to mention that they're just too unbook-like. What promise they do hold seems to be more in the realm of vocational needs (as in reference or technical), rather than avocational interests. SCIFI.COM, the official site of the SCI FI Channel and the largest general interest sci-fi site on the Internet, is seeking an experienced Community Producer to serve as the primary online liaison between SCI FI and our members. The ideal candidate will have experience leading community discussions, moderating live celebrity chat events and monitoring Web-based bulletin board systems. Other responsibilities will include professionally and effectively corresponding with our members, creating weekly member newsletter updates, maintaining site FAQs, and helping to develop new community initiatives as well as propose ways to better serve our membership and help increase enrollment. We are looking for someone who is reliable, friendly and courteous, someone who is passionate about the science fiction genre, and someone who feels comfortable interacting with SCIFI.COM members. The job is based out of SCI FI's mid-town Manhattan offices. If interested, please send your resume and a cover letter outlining your previous online community experience and stating why you are the ideal candidate for the position to employment@scifi.com. On July 22, 2001 a belated party was held to observe Jack Williamson's 93rd birthday. Also being celebrated were the release of Williamson's 53rd novel, Terraforming Earth, his recent Hugo nomination for novella "The Ultimate Earth," and the completion of his first "Legion of Space" story in 18 years (currently looking for a home). 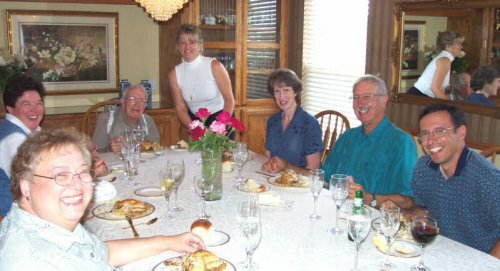 Among family and friends attending were (clockwise from lower left) Janet Hauptmann (the hostess), Betty Williamson, Jack Williamson, Jane Thompson, Patrice Caldwell, Milz Bickley, and Mark Gallegos. 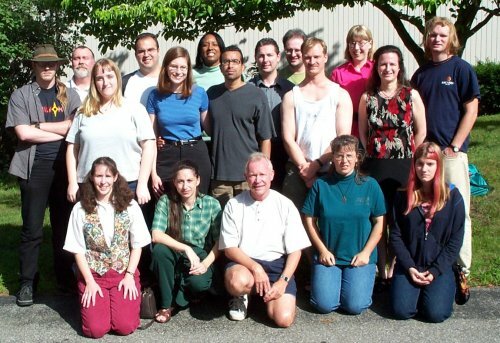  The 2001 Clarion West Writers Workshop, held in Seattle, Washington, graduated 17 talented men and women from the US, Canada, Australia, Switzerland and Great Britain -- the most diverse class in the workshop's eighteen years. 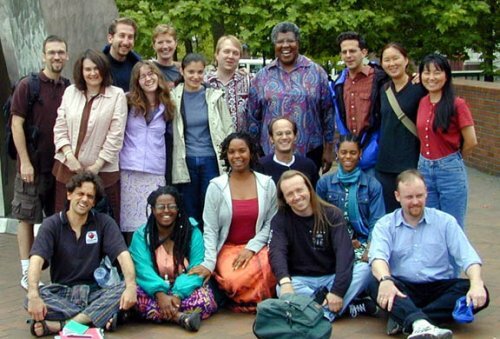 Writers in residence this year were Octavia Butler (in the photo, standing just to right of center, with students above), Bradley Denton, Nalo Hopkinson, Connie Willis, Ellen Datlow and Jack Womack. A report on the workshop from Leslie Howle will appear in Locus Magazine. An interview by Jeff VanderMeer with the Clarion students is posted on The Alien Online. Both Locus publisher/editor Charles N. Brown, and contributing editor/reviewer Ed Bryant, underwent angiograms this past week. Brown spent the night in the hospital following an angioplasty, while Bryant avoided that consequence, at least for now. Both men report they are feeling fine. Andrew Burt is posting updates on Ed Bryant's status, here, while Ed's own words are available on www.wormholebooks.com on the "Writing News" page. § The 2001 Mythopoeic Awards were announced at a banquet during Mythcon XXXII in Berkeley, California, on August 6. Snyder's novel won for its 2000 paperback edition, which was eligible since the 1998 hardcover edition had not been a finalist. For the nonfiction (scholarship) categories, books published during the past three years (1998-2000) were eligible, including previous finalists. The complete list of this year's finalists, as well as acceptance speeches by the winners, are on the Society's website. § The Mark Time and Ogle Awards, for best SF and fantasy audio productions respectively, were presented at CONvergence 2001 in Bloomington MN, July 6-8, 2001. Additional links and past winners are available on the awards' website. § The Spanish Association of Fantasy and Science Fiction (La Asociaci�n Espa�ola de Fantas�a y Ciencia Ficci�n) has announced finalists for the 2001 Ignotus Prizes, winners to be anounced September 30. Nominees in the foreign novel and story categories (listed on the SFWA site) include Neal Stephenson, Greg Egan, Robert Silverberg, and others. Born in August 10, 1912, Amado was the most famous Brazilian author of the 20th century, translated into more than 30 languages. Many of his novellas and novels were adapted for the movies or TV, including many pieces turned into telenovelas, the Brazilian soap operas, turning him a hugely popular author in Brazil. His diffusion around the world helped to establish a particular Brazilian cultural estrata as a front for the whole Brazilian culture -- a world of sensuality, humor, and mysticism, centered in his beloved State of Bahia, often approaching the magic realism effect, such as in his novel turned into movies, Dona Flor e seus Dois Maridos (Dona Flor and her Two Husbands), one of them a ghost. He was a Nobel Prize candidate a number of times. His is survived by author Z�lia Gattai, to whom he was married since 1945, and a daugher, Paloma, and a son, Jo�o Jorge.